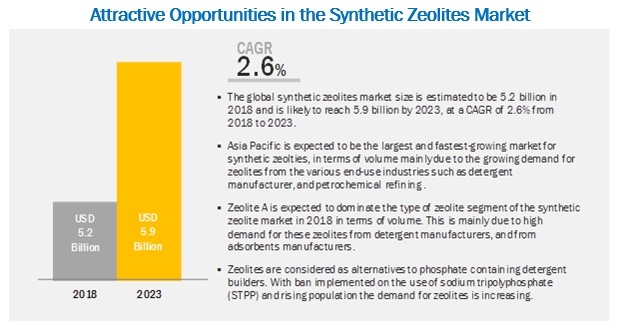 [175 Pages Report] The synthetic zeolites market is projected to grow from USD 5.2 billion in 2018 to USD 5.9 billion by 2023 at a Compound Annual Growth Rate (CAGR) of 2.6% during the forecast period. The growth of the synthetic zeolites market can be attributed to the increased consumption of detergents due to the growing population and demand for zeolites for use in specialty applications. Type X zeolites belong to the Faujasite family of zeolites and are used as sorbents and catalysts. The silica-to-alumina ratio of type X zeolites is between 1–1.5. 13X is a commercially used type X zeolite which has the largest pore size of 10A. It has a Faujasite framework and is used in gas drying applications. However, 13X with sodium as a cation has a pore size of 8A. It is an alumina zeolite and has a wide range of industrial applications such as gas adsorption and separation, besides being used as a catalyst. Several commercial detergents contain synthetic zeolites, which help in increasing their washing efficiency. Detergents containing synthetic zeolites have high adsorption capacity for liquid components, especially surfactants. Synthetic zeolites are used to manufacture compact and super compact detergents. After the ban by the European Union (EU) on the use of Sodium Tripolyphosphate (STPP) in detergents to control the increasing level of soluble phosphorus in municipal wastewater, Zeolite A was considered an ideal substitute to STPP and witnessed a substantial increase in demand. Asia Pacific is expected to record the highest growth rate during the forecast period, due to the presence of leading economies, such as China, and India, in the region. The Chinese oil market is controlled by four national oil companies—China National Petroleum Corporation (CNPC), China Petroleum and Chemical Corporation (Sinopec), China National Offshore Oil Corporation (CNOOC), and China National Chemicals Import and Export Corporation (Sinochem). Over the past few years, China’s oil consumption has increased rapidly. India has emerged as one of the key markets for synthetic zeolites in the Asia Pacific region. The market in India is driven by the growing population, economic growth, increasing industrialization, and infrastructure development. With the country witnessing remarkable growth in the agriculture, architectural materials, automotive, aerospace, aviation, chemicals, and water filtration sectors, the demand for adsorbents is also growing in the country. Major companies in the synthetic zeolites market include Albemarle Corporation (US), BASF SE (Germany), Honeywell International, Inc (US), Clariant AG (Switzerland), W.R. Grace & Co. (US), TOSOH Corporation (Japan), Union Showa KK, (Japan), Zeochem AG (Switzerland), KNT Group (Russia), Arkema SA (France), Zeolyst International (US), Huiying Chemical Industry (China), Chemiewerk Bad Kostritz GMBH (Germany), National Aluminium Company Limited (India) and PQ Corporation (US) are some of the leading players operating in the synthetic zeolites market. These players have adopted expansions, investments, acquisitions, partnerships, agreements, and joint ventures as the major strategies to consolidate their position in the market. The synthetic zeolites market is a matured market and is hence witnessing slow growth. Expansions, agreements, and new product launches have been the most dominant strategies adopted by major players between 2013 and 2018. In December 2017, Albemarle Corporation launched Granite, a new technology for the Fluid Catalytic Cracking (FCC) catalyst market. The line of products introduced to the market under this technology include PEAK, Everest, and Denali. Granite expands catalyst formulation and enables refiners to maximize their profitability. In September 2017, BASF SE expanded its zeolite production capacity with a new facility for specialty zeolites at Ludwigshafen, Germany. This facility produces emissions catalysts for heavy-duty and light-duty diesel vehicles. These specialty zeolites help in chemical, petrochemical, and refining applications. This facility made BASF SE the largest producer of specialty zeolites worldwide. In October 2016, Honeywell UOP, a subsidiary of Honeywell International Inc., licensed its Unicracking technology to Dongying Qirun Chemical Co. Ltd (China) for the production of diesel and naphtha. This development strategy enabled Honeywell to address the growing domestic demand for transportation fuels. How is the ban on the use of STPP impacting the growth of the synthetic zeolites market? How is the increased demand for catalysts from the refining industry impacting the synthetic zeolites market? How are expansions helping the growth of the synthetic zeolites market? Who are the leading players in the synthetic zeolites market? How can specialty zeolites unlock new opportunities for growth in the synthetic zeolites market? 13.5 W. R. Grace & Co.
13.12 Huiying Chemical Industry (Quanzhou) Co., Ltd. This research study involved four major activities in estimating the current market size for synthetic zeolites. Exhaustive secondary research was done to collect information on the market, the peer market, and the parent market. The next step was to validate these findings, assumptions, and sizing with industry experts across the value chain through primary research. Both, top-down and bottom-up approaches were employed to estimate the complete market size. Thereafter, market breakdown and data triangulation procedures were used to estimate the market size of segments and subsegments. In the secondary research process, various secondary sources such as Hoovers, Bloomberg BusinessWeek, and Dun & Bradstreet were referred to, so as to identify and collect information for this study. These secondary sources included the annual reports, press releases & investor presentations of companies, white papers, certified publications, articles by recognized authors, gold standard & silver standard websites, food safety organizations, regulatory bodies, trade directories, and databases. Key players in the industry were identified through extensive secondary research. After arriving at the overall market size-using the market size estimation processes explained above-the market was split into several segments and subsegments. To complete the overall market engineering process and arrive at the exact statistics of each market segment and subsegment, data triangulation and market breakdown procedures were employed, wherever applicable. The data was triangulated by studying various factors and trends from both, the demand and supply sides, in the detergent, petrochemical refining, wastewater treatment, and automotive industries. Micromarkets are defined as further segments and subsegments of the synthetic zeolites market included in the report. Core competencies of companies are captured in terms of their key developments and key strategies adopted by them to sustain their position in the synthetic zeolites market. Albemarle Corporation (US), BASF SE (Germany), Honeywell International Inc (US), Clariant AG (Switzerland), W.R. Grace & Co. (US), TOSOH Corporation (Japan), Union Showa KK, (Japan), Zeochem AG (Switzerland), KNT Group (Russia), Arkema SA (France), Zeolyst International (US). Total 25 major players covered. This research report categorizes the synthetic zeolites market based on the type of zeolite, application, function, and region.